Don’t be shy about asking both your broker and potential funders questions. Where are they located? How long have you they been in business? Are they accredited? Do they have state lending licenses? Be deliberate in your decisions and arm yourself with the proper knowledge first. On your application you will see a clause that allows funders and brokers to pull your credit. Your credit may be pulled once or multiple times. Hard inquiries impact your credit score. If you’ve recently had your credit pulled, include a report in your submission and ask for your credit not to be pulled. You can also ask your broker to advise funders that you would like a “soft approval” pending credit, so you can get an idea of the kinds of approvals you might qualify for before sacrificing some credit points. Make a note of the logo, address, and company name on the application. Once your application is processed, many different brokers may contact you. To ensure you get the best service, only work with the broker whose application you personally signed. No one knows your business better than you do! Inform the broker of all relevant business information so that they are able to package the information properly for an underwriter’s review. If you are in need of $50,000 for a deck expansion and need a longer term or weekly payment because your payroll expenses- request it! Provide as many details as possible so that your broker can appropriately represent your business. Communicate with your broker and make your wishes clear, but make sure you can afford the products they present to you. Trusting your broker is important, but you are your own best friend. You know what you can afford. If you feel what you are presented isn’t the right fit- don’t take it! If you need $50,000 and are offered two contracts that equal roughly 50k from two different funders, this is a red flag. This could mean that you do not qualify for your requested amount, but you are unknowingly doubling up to obtain it. Committing to more than one advance at a time could have serious repercussions for your business. Your cash flow could suffer and the daily payments may be more than you can handle. To ensure that you receive the best service and financial advice, commit to working with one broker. Disclose all your relevant financial information to them and ignore the phone calls or marketing emails you may receive from their competition. 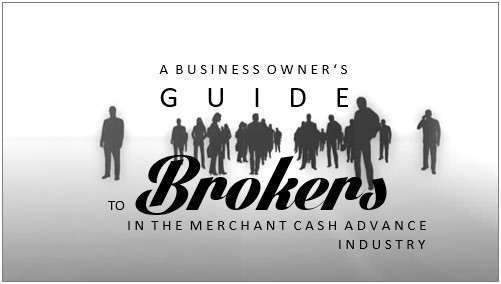 Additionally, if you work with many brokers, key funders in the industry will see your application multiple times and consider you to be “shopping.” Shoppers are taken less seriously than companies that work with one broker at a time and this could negatively impact your chance of getting an approval.